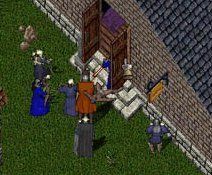 Eventually, responding to the needs of players, many of whom over time had lost thier house keys, OSI began to implement a series of housing changes. By this time the world was a very different place than in the early housing days. Prices for houses were 4x what they were in the beginning if you bought a deed and 4-5x the deed price if bought on the open market. Space to get a house is almost non-existant. Sweeping house reform was put into place. Players gained the ability to change locks, ban people from their houses, lock down items, store things in secure checks and more. As a trade off, new spacing rules went into affect making a house need a larger clear area to place and hence making it harder to place a house. The affect of this on AD was minimal. The island was already fully loaded and its layout and structure already set. The affect of this on the guild, however, was substantial. Since the origonal owner of a house was hard to determine and since some had quit and some houses been "sold" , OSI implemented a method to claim houses using the keys and who placed the house. You could go around and each char could claim one house. Since The Syndicate had successfully raided many pkiller bases over time and taken their keys we had a bag with hundreds of keys in it. 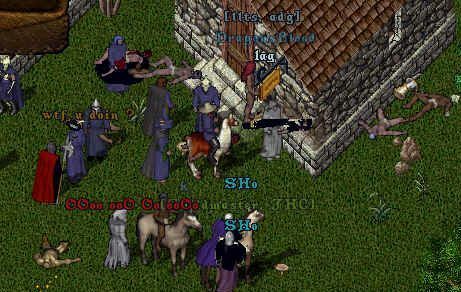 Scouring the world, we ended up claiming several dozen pkiller houses as our own and turning them over to members for personal houses. The housing patch turned out to be a great boon to the guild getting many members a house in a world where it was nearly impossible to get one. One thing all these housing changes did stop was "house looting". House looting comes in two flavors. The first is the illegal kind. Players using bugs and cheats to loot through walls, get over tables or get back locked doors. Alot of punk kiddies used these and a great many houses were looted this way including Syndicate members houses (although thankfully no guild storehouses were ever looted). The Second method is the one the Syndicate subscribed to. The legitimate, time intensive, stakeout of an enemy (in our case, pkiller) base to either steal his key or get into his house. This method was hard and involved many members working together and often hours or days of work. Houses were staked out. 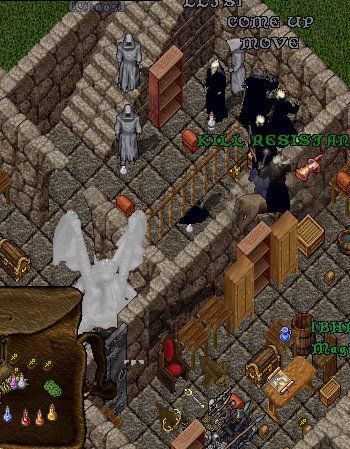 Attack teams would form up one gate away ready to jump at a moments notice and the entire guild had to work together. Killing a pk doesnt really hurt them. They kill so many innocents that they have mountains of loot stashed in their base. The only way to really hurt a pk is to take thier base from them or take all their loot. The Syndicate did this time and time again looting nearly every base of nearly every enemy we had including the mercs, SSJ, CC and many many others. In one week alone, we successfully staked out and looted 3 pkiller enemy towers.